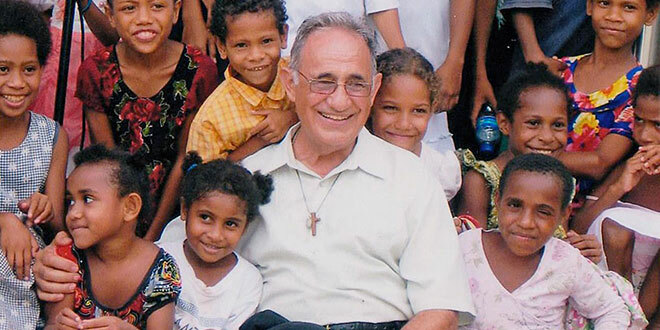 Life minstry: Fr Paul Mercieca spent 26 years serving the people of Papua New Guinea. FR Paul Mercieca has experienced many challenges and adventures during 50 years as a Passionist missionary priest. Quietly spoken and with an infectious sense of humour, Fr Mercieca has survived a machete attack, suffered three bouts of malaria, and has travelled to Buckingham Palace to meet the Queen. Now working in Brisbane as an aged-care priest, he is beloved by Brisbane’s Passionist community of “The Fort”, or St Mary’s Retreat Oxley, which celebrates his golden jubilee with a Mass on today (May 28). Mission work and an “unconventional” religious life are the starting point for any conversation about Fr Mercieca. A 5cm scar on Fr Mercieca’s forehead is a harsh reminder of a street attack by a mentally unstable man in Port Moresby in 2008. “The machete just shattered my glasses as it came down and hit me on my skull,” he said. The attack left Fr Mercieca with some memory loss, but it did not diminish the joy he feels for 26 years of missionary work in Papua New Guinea. “Any missionary has to face the impossible sometimes – rejection by the people, lots of violent times, and a lot have been killed,” he said. “It was very fulfilling work as a priest and I was very impressed with the faith of the people – their Christian faith and fine devotion to the Church. Born into a devout Maltese Catholic family in 1941 in the Broken Hill cathedral parish of the Sacred Heart, Fr Mercieca was the eighth of 10 children. His family said the Rosary every weeknight, on Saturdays they prayed the novena to Our Lady of Perpetual Succour and all attended Mass on Sundays. “My whole environment was family and church, and playing sports,” he said. Fr Mercieca said his parents, Maria and Antonio, prompted his vocation. His uncle was also a priest on the Maltese island of Gozo. When Fr Mercieca was seven, a Passionist priest Fr Wilfred Speers was conducting a home mission in the parish and asked young Paul to join up. Many years later he did. After leaving school, Fr Mercieca took up his priestly studies in Sydney and was ordained in the Broken Hill cathedral in 1967. He spent his formative priestly years conducting home missions in parishes in Victoria and South Australia, and in 1969 was appointed as parish priest to St Joseph’s in Hobart where he spent three years. Then in 1976, the Passionist provincial asked Fr Mercieca to go as a missionary for one year to Vanimo in Papua New Guinea close to the remote border with Indonesian West Papua. “One year stretched into 26 years,” he said. As well as learning to live simply, and adapting to a diet of fish and rice, Fr Mercieca immersed himself in the Passionists’ mission at the Senta Belong Helpim, Vanimo, and later in the parish of Boroka, Port Moresby. Senta Belong Helpim in Pidgin means “The Centre of Help”. Fr Mercieca’s mission was to give help and love to children suffering with any form of disability, or those who needed physiotherapy following surgery, or stroke or accident victims. He was challenged to develop the work of caring, exercising and teaching to those children, but he made a success of it. 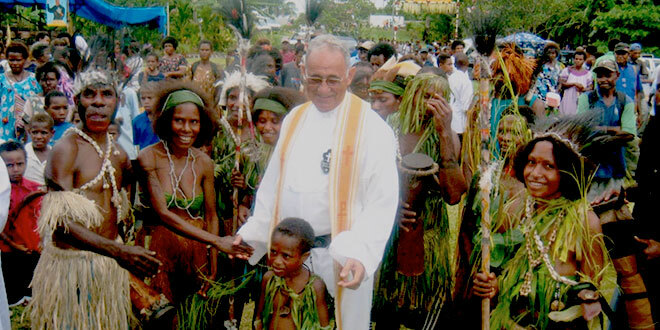 In 2009, Fr Mercieca was awarded an OBE (Order of the British Empire medal) for his service to the Catholic Church in Papua New Guinea. He travelled to Buckingham Palace to collect the award from Queen Elizabeth II. “I was nervous as I approached the Queen, but she was very gentle and warming towards me, and I felt very honoured. I thought: ‘Why me’,” Fr Mercieca said. He said that, during his decades in PNG, there were times of loneliness and sickness – including three bouts of malaria – but through all his sufferings his commitment stayed strong. In 2011, he returned from his mission work to serve at Brisbane’s St Mary’s Retreat, “The Fort”. He now works with Canossa Services, which consists of a hospital, nursing home and retirement village in Oxley. 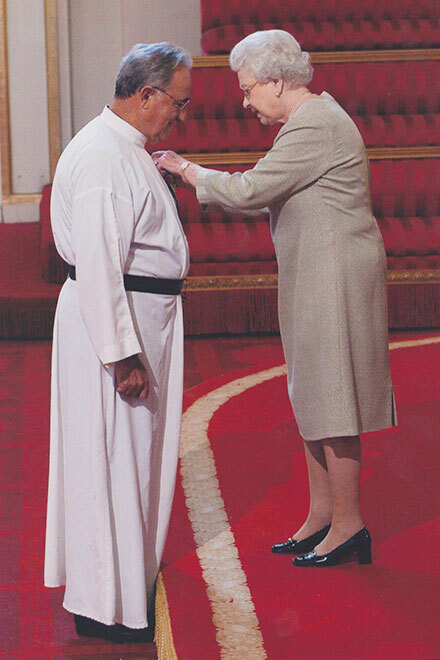 Honoured: Fr Paul Mercieca being awarded an OBE by Queen Elizabeth II. In the palliative care ward Fr Mercieca administers his special brand of love and care to his patients, based on his apostolic zeal and missionary devotion. “You’ve got to be a good listener in this line of work. Sympathise with people and support them,” he said. “As Passionists we proclaim the mercy of God, the gift of Our Lord’s suffering and death. “We can associate sickness and pain with the passion of Jesus. He too felt pain, rejection by his Father, also his best friends Peter and Judas. They walked away from him. Fr Mercieca also assists at Christ the King Church, Graceville, every second Sunday as well as helping with any other parish needs and he continues supporting missionary work. He leaves for the United States on June 8 to raise funds for a Passionist mission in Vietnam. “I’m still enjoying the priesthood very much. Bless the Lord, for His great love is without end,” he said.